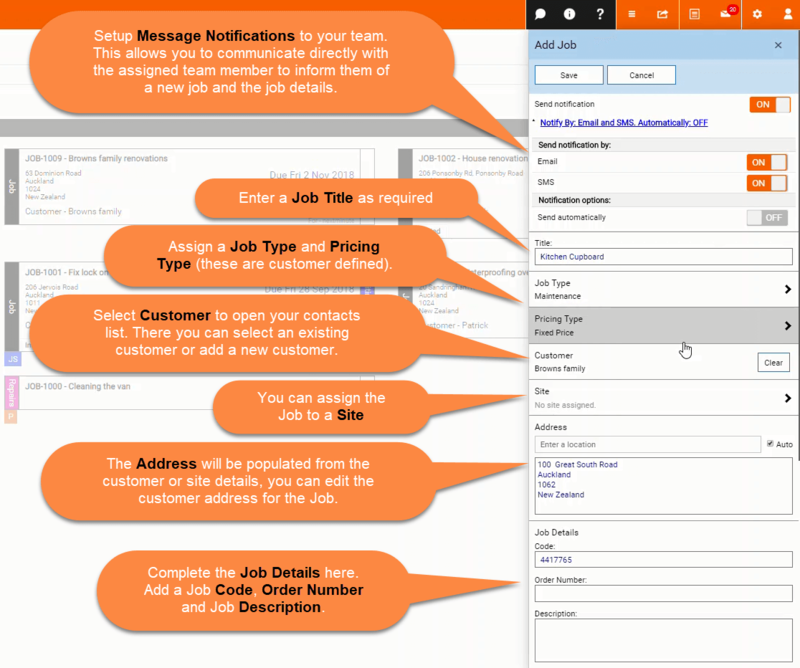 Create a Job - Desktop – Welcome to the NextMinute support and feedback centre. Creating Jobs and Tasks are core functionality of your job management. You and your team will spend much of your time adding and reviewing your work activity in the Jobs, Scheduled Tasks and Calendar areas of NextMinute. See also, Internal Jobs. In this article we show you how to create a new Job. First, navigate to the Jobs drop down in the left hand menu and select All Jobs. To create a new Job select Add. Or you can quickly add a job via the Quick Actions in the top right hand corner menu. You can also Add a Job using a template you have created. 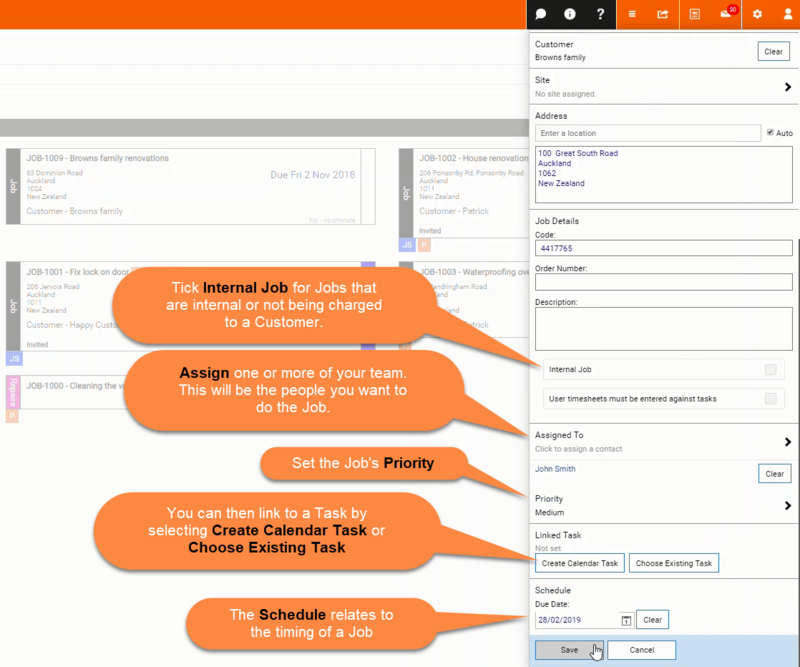 Job details continued... Save to create the Job and link to a Task by creating a calendar task or choose existing task. 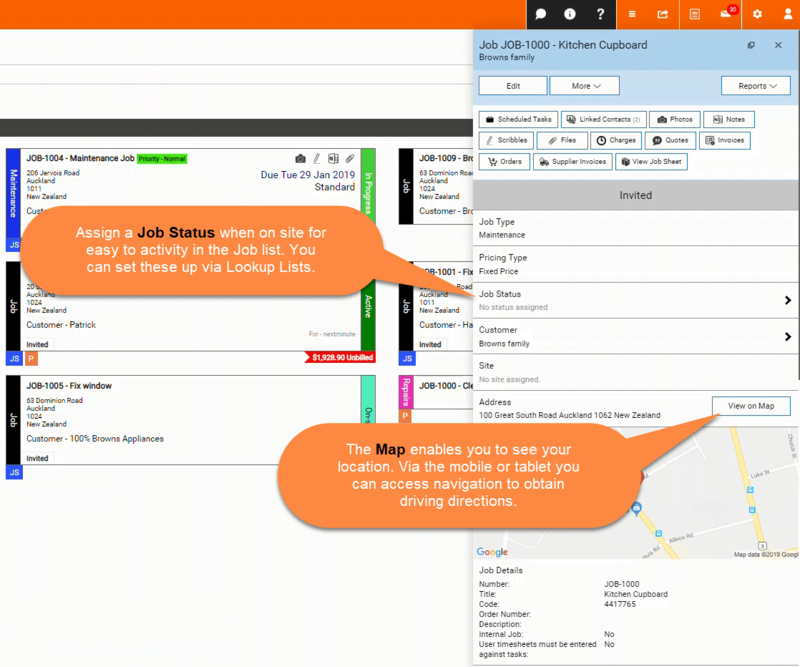 You can select to Email, SMS or internal messaging job activity. Having the ability to notify your team via SMS when you assign work is helpful to ensure your team know when new jobs or re-assigned work comes into their job queue. You could also choose to message customers to keep them informed of job updates and information, providing a better customer service experience. 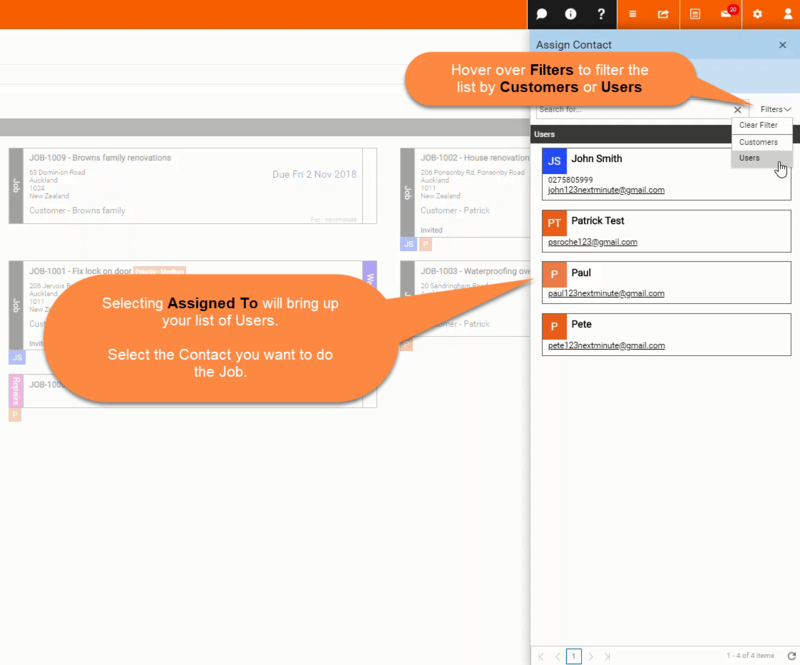 Within the Messaging area you can access Content - Templates (message templates you've created earlier) or edit free-hand. In this screen view example we show the default message for an Email and SMS message. You can add other recipients, Edit the message, Preview, Send or Don't Send. The completed job will appear as a new ticket in the Job list view or Grid view. By clicking on the Job the full job detail sheet will appear on the right hand side slide out. Select to Edit the Job. 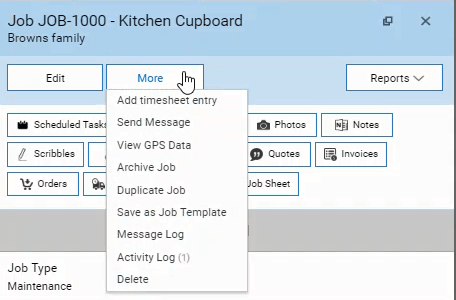 Selecting More gives you the drop down options to Add a timesheet entry, Send Message, View GPS Data, Archive Job, Duplicate Job, Save as a Job Template, view Activity Log and Delete the Job. Selecting Reports gives you the drop down option to view your Jobs Back-costing Summary report and Financial report. 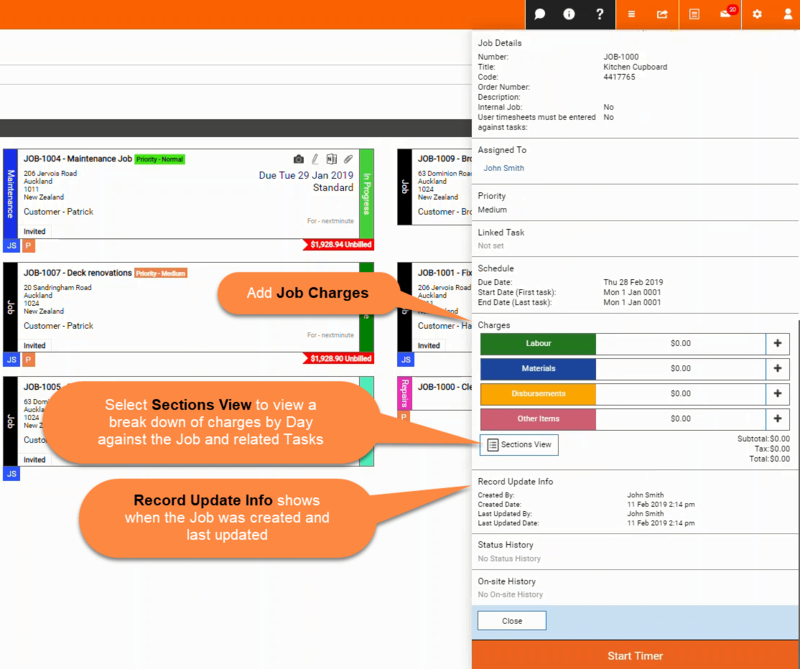 Select to view Scheduled tasks assigned to the Job, view and add any Linked Contacts, any attached Photos, Notes, Scribbles and Files, view all Job Charges, Quotes, Invoices, Orders and Supplier invoices and finally Create or View the Job Sheet.